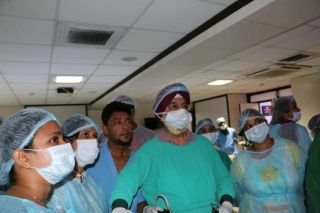 Gynecologist practicing Laparoscopic Burch Colposuspension for stress urinary incontinence and Sacrohysteropexy for uterine prolapse on the Live Tissue Demonstration by Dr. J. S. Chowhan. The Laparoscopic Sacrohysteropexy is effective and safe in the treatment of uterovaginal prolapse in women of childbearing age group. This procedure has a high success rate in correcting prolapse without a time-dependent decrease in efficiency. Today gynecologists of World Laparoscopy Hospital January batch has learnt how to perform sacrohysteropexy. The purpose of todays Hands On training was that gynecologists should be able to perform this surgery successfully for their patients so that their patient get 100% success after laparoscopic sacrohysteropexy in women with uterovaginal prolapse.